Karen Emilson was born and raised in southern Ontario, the daughter of Irish immigrants on her mother’s side; and an eclectic mix of Swiss, German and English on her father’s side. She spent all her free time as a child reading books and writing stories, dreaming one day of becoming a writer. In 1982 she came to Manitoba as a young bride, settling in at the Nordheim farm in Siglunes. Karen spent little time in the hayfield or on the lake, but instead worked as a rural newspaper reporter and wrote stories, publishing the Canadian Bestseller, Where Children Run in 1996 and its sequel When Memories Remain in 2001. For years she worked for the Manitoba Beef Producers Association, typeset the Icelandic Connection Magazine, and spent time as a consultant with Logberg-Heimskringla. When Lake Manitoba overflowed its banks in 2011, flooding out the farmland at Siglunes, she was inspired to finish a story started 10 years earlier about the immigrants who carved out a living there. She can’t sing, dance, draw or play an instrument but lives in awe of those who do. Now she lives in Grunthal, Manitoba and writes full time. Be Still the Water is her first novel. 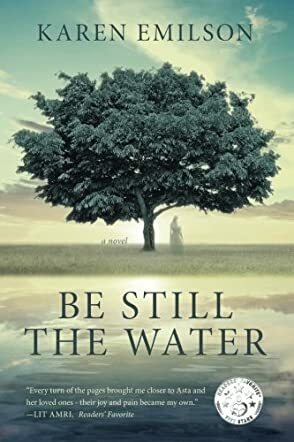 Be Still the Water by Karen Emilson is a historical novel set against the backdrop of the tranquil shores of Lake Manitoba in the early 1900s, a story centered around the immigrant Gudmundsson family and their struggles to settle among the Siglunes in the early years of the twentieth century. But it’s not just about immigrants embracing a new life in a new country. Things would have been different if Pjetur's daughter, Asta, didn’t fall head-over-heels in love with the miller’s son. As if that wasn’t enough to cause trouble for the family, Asta’s younger sister disappears. Will Asta be able to accomplish her mission of locating and bringing her sister home? Be Still the Water is a family saga involving love and secrets, a tale that is as heartwarming as it is heartbreaking, but one worth reading. The story is told by the old woman who is nearing her death bed, and in a voice that is warm and intelligent, full of the wisdom of age. The first person narrative is a style the author uses as a master and it draws readers in immediately. At the very opening of the story, the author introduces one of the powerful conflicts and issues that move the gripping plot, the disappearance of Freyja, which immediately makes readers start asking questions. “Oh Freyja, where are you? Not knowing your fate has tormented me for nearly seventy years. Before I go, I will make good on my promise to find you.” After losing her sister for nearly seventy years and at her ripe old age, readers could well wonder if she has the strength to find out the truth. They won’t be disappointed because the narrator will navigate her family’s history with them and lead them through unusual paths. I loved the language, the vivid descriptions, the occasional bursts of wisdom, and the compelling characters. Karen Emilson has won my interest in her work and she skillfully establishes herself as an expert in the historical fiction genre. One striking aspect of this work is to see how the author allows the narrator to portray her age and state of mind, allowing her personality to come across powerfully without distracting the reader. The idea of an old woman looking back at her family history lends the narrative style a flavor that will delight many readers. A family saga with an enticing plot and a wonderful setting, Be Still the Water by Karen Emilson chronicles the life of a family and the challenges it faces settling down by the shores of the Manitoba Lake way back in the early 1900s. Told by Asta, now an old woman on the brink of death, this story is highly entertaining and heartwarming. Readers get to know the narrator as an old woman at the start of the story, but things get even more interesting as they journey back with her to the early years of her life to relive the family tensions, the impossible love affair, the heartbreaks, the secrets, and the disappearance of a sister. The story begins at the end, with the intelligent and humorous ramblings of an old lady, a woman brimming with life in spite of her age. She immediately introduces readers to one of the serious conflicts of the story: finding her sister Freyja. Karen Emilson’s style is unique and the writing exquisite, with powerful techniques to reveal the mental state and maturity of the narrator. Characters like Asta are unforgettable and readers will so naturally feel drawn to her world. Apart from the beautiful prose and the absorbing plot, the author has a powerful gift for humor. Even in the heart of difficult and complicated scenes, she knows how to put a smile on the faces of her readers. Be Still the Water will entertain readers and make them long for more, especially those who are fans of historical family stories spiced with mystery. The read was incredible for me and I devoured the story faster than I thought. If you have no time to read, you’ll create time for Be Still the Water. You only have to start! Be Still the Water by Karen Emilson is told through Asta Gudmundsson’s perspective about her immigrant family’s beginnings as they arrived at the Icelandic farming and fishing community of Siglunes to start a new life. The aged Asta visits her past memories, as she longs for the good old times and her younger sister, Freyja, whose disappearance changed the lives of everyone she loved forever. Emilson’s descriptions of places, people and conditions are very vivid and engaging. I gravitated toward the female characters in this story, particularly Amma, Asta’s grandmother. Emilson shows light, humorous touches that portray her as she is the kind of individual that I would like to know in real life. Every turn of the pages brought me closer to Asta and her loved ones - their joy and pain became my own. Be Still the Water is a simple but beautiful and intricate story about family, a reflection on love, life, tragedy, friendship and death. With its realistic storyline, it has the charm to make any reader wonder whether this is a fiction at all, along with its unforgettable characters.